When you are beginning to prepare for the SAT, it may feel overwhelming to know where to start or how to focus your attention. Here are 4 test prep ideas that will help you focus your studies so that you can perform well on the exam. An article from Time points out that the new SAT math section has a focus on data interpretation and problem solving. You will need to be familiar with how to read and interpret graphs and charts. Time suggests using ACT science prep materials to help you study for this kind of data interpretation. Much of the SAT will require your to comprehend reading passages. These texts will be used throughout the test, even in the math portions. You will be required to infer the meaning of words based on their context. You can use flashcards to build up your vocabulary, but you also need to hone your skills for comprehension. As you read, take guesses at the meaning of unfamiliar words, then look up the actual meaning. Looking up words will broaden your vocabulary and inferring meaning will improve your comprehension. You may be great at reading comprehension when it comes to literature, or science, or non-fiction, but on the SAT you will be required to comprehend passages that may not be in your comfort zone. The SAT could include passages from poetry, important government documents, scientific studies and more. While these passages will cover a broad range of topics, they will also cover a range of time periods. Read as much as you can from different time periods, subjects, and styles so that you can comprehend any passage you might encounter on the SAT. The new SAT focuses on real world problems and wants to test your critical thinking and problem solving skills rather than just your knowledge base. Going above and beyond in your regular school work may help you prepare for the test. When you approach math problems, try to solve them without your calculator first. Know all the steps you need to solve the problem and write down all your work. Taking these extra steps will help you become a more efficient problem solver. Because the SAT demands that you use critical thinking skills, you will need to use your prep time to hone those skills. SAT prep requires that you go beyond memorizing facts and regurgitating knowledge. You will need to use the knowledge you have to solve problems and interpret meaning. If you practice those skills now, you will be able to easily demonstrate them on the exam. Students generally dread test prep classes. They’re boring, difficult and pointless, or so most kids think. 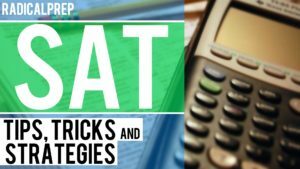 But they’re also necessary… Recognizing this, Mr. Test Prep has created a new approach to SAT/ACT tutoring that gets the job done without all the pain and frustration of traditional programs. Rather than depleting the finite well of motivation your student will need to get you through senior year, come to Mr. Test Prep for the most painless—dare I say fun?—SAT Prep in the Cupertino area. Specializing in the psychology of test taking, as well as the academic practices required to succeed, the lessons learned at our Cupertino SAT Prep center will empower your student both on Test Day and in their future academic endeavors.